Soak the beans in cold water overnight. Place the beans in a saucepan filled with water and bring to a boil. Simmer until the beans are tender, then drain and set aside. Rinse and drain the spinach. Fill a large pot with water and bring to a boil. Add the spinach to the boiling water and boil for 5 minutes. Drain the spinach and place in a bowl filled with cold water. Drain again and using a wooden spoon, mash the spinach. Heat oil in a pan and add the flour. Cook and stir over medium heat. When the flour turns slightly brown, add the water and continue stirring. Add the spinach and salt, stir well and turn off the heat. Bring a large pot filled with salted water to a boil. Add the pasta and cook for 8-10 minutes. To serve, spread some yogurt over a serving dish, place the drained pasta in the dish and stir in more yogurt. 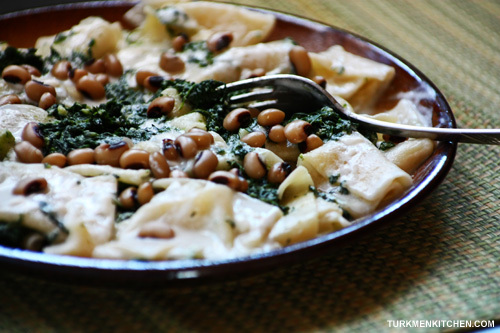 Top with the spinach, beans and dried mint.